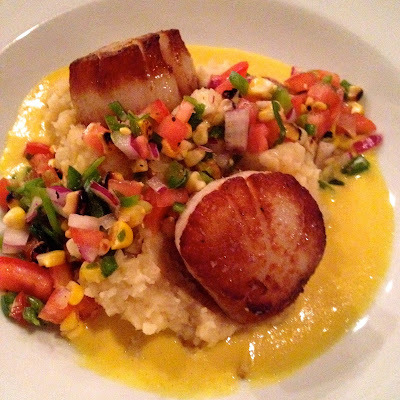 Scallops enhanced with Silver Queen Corn Butter. Spur-of-the-moment on a Friday night in Valdosta, GA, the last thing I expected to find was a table at a must-try, memorable restaurant. To be honest, I didn't expect anything better than a chain joint, but Steel Maganolias in a downtown where most sidewalks were rolled up was a revelation. So was learning Valdosta had a Restaurant Week and my friends and I had stumbled into it. A three-course meal for $25? Perfect. The Kale Salad with blueberries, feta, toasted almonds with Georgia Peach vinaigrette almost was, but the Pan-seared Sea Scallops with Yukon gold mashed potatoes, tomato, corn and green onion salsa and silver queen corn butter hit bulls-eye on the perfection target. Especially the silver queen corn butter. It could make shoe leather a gourmet treat. When I prevailed upon owner/chef/manager Keira Moritz for the butter recipe, she could not have been more gracious. So quick, go to your farmer's market, grab that corn and get cooking. Cut corn off the cob. Put cobs in a large covered pot with a bit of the onion, salt and pepper and add just enough water to cover. Boil until reduced to one cup. Saute corn in oil with garlic then add corn stock and cream. Reduce by one-fourth and season to taste with salt and pepper. Mix with butter in a blender and strain if desired.